All Outlook User Defined Fields are displayed in Bold in the User defined field list. ACT-To-Outlook Professional allows the user to create corresponding Outlook User defined fields for ACT! records. · Add Outlook User Defined Field: add a user defined field to Outlook by simply typing in the input box. Duplicate fields will be ignored. Also, all fields are considered to be of type string. · Remove Outlook User Defined Field: remove the selected Outlook user defined property from the list of defined fields. You can only remove user defined fields. · Retrieve User Properties from Existing Contacts. If you already have outlook contacts that have the user defined fields that you want, you can search outlook for these fields using this option. 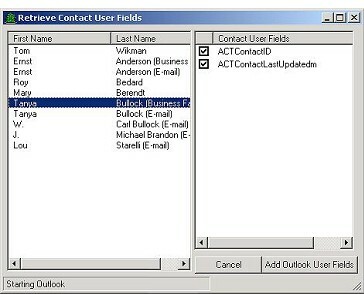 This option creates a screen that displays all the contacts in the Outlook Contact Database and when you click on the contact, it will display the user fields defined for that contact. By clicking on the contact, this screen displays the user defined fields found for the contact. Note: if the user defined field has an empty value, Outlook does not see it as a user defined field and it will not appear in the list! To add these user fields to the list of user fields that you want to create, select the Add Outlook User Fields button.